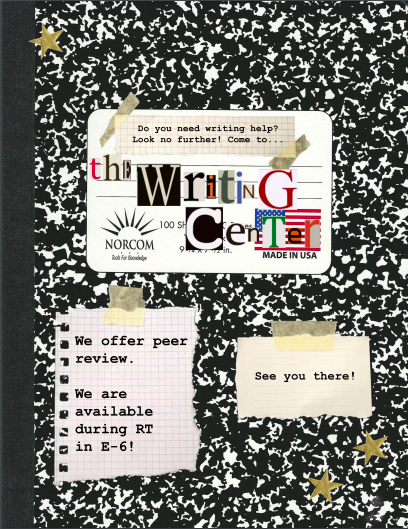 The SMHS Writing Center is available to assist students with peer review during Royal Time in E-6. If you have students who need extra help in writing, send them our way. Also, I've attached a revised copy of the SMHS Writing Center: Steps to Success writing guide and a Writing Center Poster for your classrooms. In addition to peer review, the Writing Center curates The Conversation, an online literary arts platform, where we feature student voices (Spanish or English) in poetry, short story, personal narrative, argument, and response to literature. All students who submit work to The Conversation will be entered into the Phreaner Writing Contest at the end of the year and eligible for cash prizes. Please encourage your students to submit. The Writing Center will also be hosting Slam Marcos, our annual poetry slam, the week before winter break. Thank you for your support!